This is not an “I love my Nana because…” book. This is a book about fear of otherness. Otherness is anything or anyone who is unlike you, or is unfamiliar. The protagonist, a little boy, fears for his Nana because she is living in an unfamiliar environment filled with otherness. Much like how small town America might see the city. The city is New York and the next page opens up to a double page spread of the Brooklyn Bridge with ferries and boats traversing the East River and Manhattan behind it. The city is a nuanced character; the city is a stand-in for humanity. I am in deep love with Ms. Castillo’s art for this book. Heavily textured backgrounds (possibly a digital masking technique over handmade rubbed texture) show brick buildings with their iconic water towers. They are detailed but their lack of color keeps them from fighting with the foreground for attention. There are a number of areas that look like Ms. Castillo placed her paper over New York cement to create a rubbing of that rough surface. This is like tasting the terroir of a fine wine but visual. Then there’s her watercolor technique: she has applied washes of color and at the right time sprinkled salt over the paper. This pools the pigment close to the salt crystals creating speckles and uneven, craggily, dried edges. All of these techniques help ground Ms. Castillo’s art in the real environment of New York. The version of New York she chose to illustrate is not a pretty street, clean subway car, or upscale apartment. Her version of the city has authenticity. Ms. Castillo’s art technique and conceptualization is superb. She’s imbued this book with a real New York. The title page shows Nana’s two cats, one black and one white, with a ball of red yarn and knitting needles. The black and white cats elude to the duality of the city, such as that the city is loud in jarring ways and loud in joyous ways. The city is both difficult and gritty, yet wondrous and beautiful. The color red is a marker of acceptance. The little boy calls it “bravery,” and it is being brave. Brave enough to see humanity in all its otherness and accept it. Nana has the color red throughout her outfit. I especially love the red feather in her hat. She accepts all and wears it as a badge of honor. When she lovingly knits her grandson a cape to quell his fear, it is red, and he is now brave enough to accept all too. My favorite example of this use of red is the scene where Nana and her grandson visit with a homeless man seen earlier. Previously he was perceived as being scary, in this new scene he smiles and reaches out to Nana and her grandson as they gift him a soft pretzel; LOVE is tagged above in red. To love is to accept and to accept is to show compassion. Humanity is full of duality, gritty yet beautiful. You will encounter people, places, and modes of being that are other than yourself — do not fear this. Be sensitive to your subject and show all aspects of it, even the un-pretty. This world is hard and can be scary because others may not always accept you or show you the same compassion you show them. You will have to be vulnerable, and it is necessary to have compassion. This is what bravery is all about. 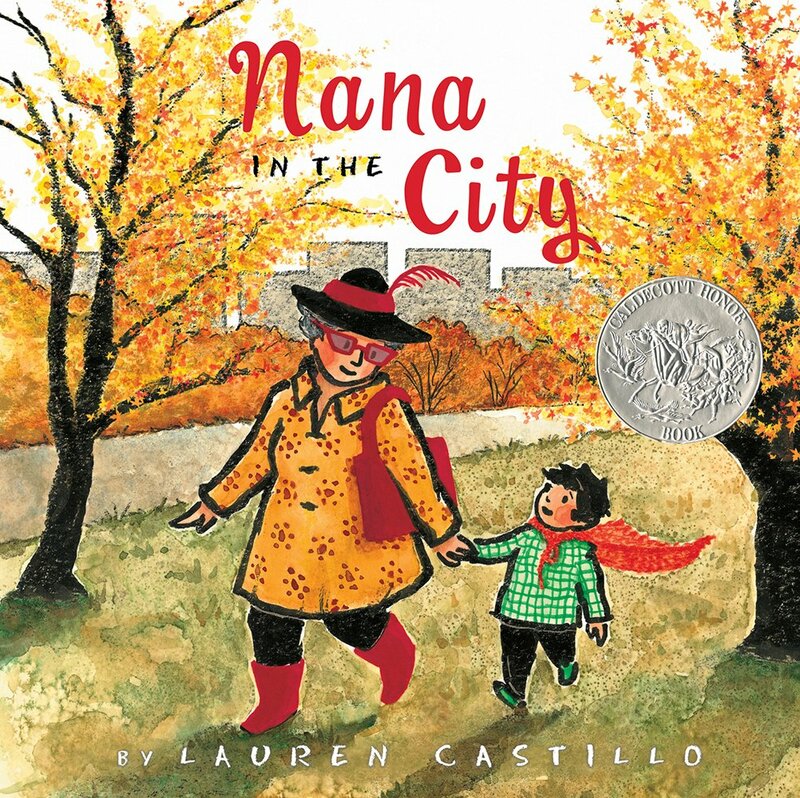 Read Lauren Castillo’s book Nana In The City, and be brave. All work © 2019 Marsha Riti unless otherwise noted.